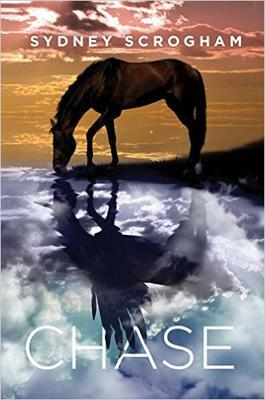 A brand new horse book, Chase, will draw you in from the very first page. It tells the story of Lauren, who is desperate to save her horse from being sold. Her only chance? To find an elusive, escaped red horse (part of a genetic experiment) and win a reward. But her chase leads to an adventure far beyond her dreams. This compelling story is like no other horse book I’ve read before. It combines the horse and fantasy genres, and is beautifully written. It has a fast pace that will keep you turning just one more page. If you’re looking for something new and exciting, you’ll find it in Chase! How long have you been a horsecrazy girl? It was a combination of so many things! But the horsey things specifically were Breyer models that I used to act out story scenes with Lego Bionicles when I was younger. The book series Unicorns of Balinor (Stanton), The Phantom Stallion (Farley), and Horse Angel (Dorsey) sparked a lot of my story world. Last but certainly not least, my first horse "Blue" taught me to think like a horse. I couldn't have written Chase's character without him. The first draft of Chase took me 18 days. The second draft took me a little longer, but I finished it during NaNoWriMo (National Novel Writing Month in November). Don't give up! Decide that you're a writer and your dreams are worth fighting for. I had a traditional publishing contract that I ended up losing before Chase was published. I had to dig around to find another publisher, but when I did, I ended up being in a better position than before. Koehler Books has been amazing to work with. If there are specific questions, you can connect with me on Facebook or Twitter. I love encouraging and giving advice to people who want to write books for a living! Do you have horses now? Can you tell us about them? I have one horse now after tragically losing "Blue" earlier this year to a broken leg. It shattered my heart, too. There's nothing like losing your first partner. Because of that, I am so incredibly thankful for the second love of my life, "Snowdy," a grey Selle Francais. "Snowdy" and I have a story worthy of a children's book that I might write someday. I met him when I was working at my college's equestrian center, and he was a lesson horse there. At the time, "Snowdy" was angry and in a lot of pain with Lyme Disease, but we got along well. I could see potential and intelligence in his eyes. In spite of his attitude and his inability to stand still in the cross ties, he became my recurring lesson horse while I was in college. My instructor knew we got along well from the first time she saw me on "Snowdy." I started telling the barn staff, "When you guys are ready to get rid of this horse, I want him." I figured by then, I'd be graduated from college and ready to take on another horse. My assumptions were wrong. Less than 6 months later, the barn manager asked me if I was serious about taking "Snowdy." He'd become a safety hazard for the college lesson program. I said yes, I still want him, and the process was set in motion to transfer "Snowdy" to me while I was still in college. I had to jump through a lot of financial loop holes, but long story short, "Snowdy" has been with me ever since. The best part is that I'm finally starting to see all the great things I knew were in him before. He's not an angry lesson horse anymore, he's not underweight, and he'll stand still in the cross ties. It makes my heart so full to see him thriving. I think I needed him as much as he needed me. We were made for each other. Well done on the book!